To paraphrase the Supeme Court on another topic, while it’s often difficult to describe leadership, you know it when you see it. That’s certainly true in the Latino community. 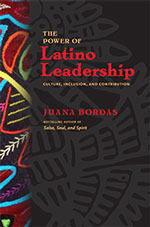 In her book, The Power of Latino Leadership, Juana Bordas distills leadership into ten principles that we can easily recognize in successful Latinos. And most importantly, these are things that we can all learn from. The author practices what she preaches, and herself embodies many of these principles. The first in her family to go to college, Bordas joined the Peace Corps and worked in the barrios of Santiago, Chile. Once back home, she became the founding president of the National Hispana Leadership Institute, a leading organization which prepares Latinas for national leadership. Today, she’s president of Mestiza Leadership International, a company which focuses on leadership, diversity and organizational change. Below is an excerpt from the preface of The Power of Latino Leadership. I grew up in the early nineteen fifties when Latinos were in a cultural no man’s land. These were the days when the signs No Mexicans – No Dogs hung in the windows of Texas restaurants and my mother was embarrassed by her broken English. In fact, the term Hispanic as an official designation only occurred after the 1980’s census. If my mother was alive today she would marvel at how far Hispanics have come. Un milagro – a miracle! Then she would make the sign of the cross in gratitude for divine providence. Many people believe that the rising Latino influence is a recent phenomenon fueled by our exploding demographics. It’s true that the Latino population in the U.S. grew by 43% in the last decade accounting for more than half of the population gain. Today one in six people in the U.S. are Hispanic. Our numbers are over 50 million strong. And tomorrow? By 2050 one in three Americans will be Hispanic. Most Latinos, however, understand that our advancement has taken centuries. Our roots go back to before the U.S. was a nation. Hispanics were born of conquest and colonization. We are a fusion people –mainly the off-spring of the Spanish Conquistadors and the Indigenous people of this hemisphere. Many Hispanics have African descendants as well as other European mixtures such as German and French who also settled the Americas. Hispanics are a mixture of cultures, languages, races, and nationalities. And yet today, we are emerging with a strong identity. Latinos are embracing their culture and language, gaining economic and political clout, and expanding their global connections. These gains have only been possible because of the vision, contribution, and relentless activism of our leaders. They have built a legacy of inclusive community leadership based on cultural values and traditions that has as its purpose to uplift people. And yet the story of how Latinos leaders have guided their people has not been fully told. The Power of Latino Leadership aspires to make that contribution and is the first book squarely focused on describing the principles and practices of how Latinos lead. It will assist Latinos to be effective and powerful by leading from their cultural core and will infuse mainstream leadership with an inclusive community spirit that fosters contribution and service. The concept of Latino power, however, warrants a new definition. Historically, power was hierarchical, the domain of the influential few, and associated with control and dominance. Most often power was found in the hands of White males. Latino power, on the other hand, has evolved from the community – it is the power of WE – the power people have to change their lives for the better. Moreover, Latinos are diversity – they are culture and ethnic group, not a race. Latinos are Brown, Black, White, Yellow and all the beautiful hues in between. Some Latinos have ancestors who were here before this was the U.S. Others have recently immigrated. Our extended families are composed of multiple generations. These differences drive an inclusive leadership form rooted in the culture’s expansive diversity. Latino leadership is one of coalition-building, bringing people together, working across sectors, and embracing a consciousness of partnership. Latino leaders leverage the power of inclusion. Latinos maintain close ties to their 22 nations of origin and are culturally linked with people in North, Central, and South America. Over one-third of continental U.S. was historically part of Mexico and these cultural roots remain strong. Latinos power, therefore, is global in scope. Furthermore, until the last decade, over 40% of Latino growth was fueled by immigrants who bring hope, determination, and replenish the cultural core. Unlike previous waves of immigrants, Latinos are acculturating not assimilating. Many other immigrants who came to the U.S. assimilated. They discarded their cultural roots and became part of the melting pot. Latinos, on the other hand, are bringing their gifts into the mainstream and infusing the U.S. with a Latin flavor. Latino power is rooted in history and tradition – an understanding that the past is the rich soil that nourishes tomorrow. Latinos owe a great debt to the leaders who have paved the way for our community to blossom. The Power of Latino Leadership acknowledges their legacy and contributions and delineates a path for continued Latino advancement. And Latino power is our future – the promise and potential of youth. For the first time, the U.S. census reports that the majority of babies born in 2011 were a warm color of brown, chocolate, or latte. They are ethnic and racial minorities and the majority is Latino. Today, one- in-five school children is Hispanic as are one-in-four newborns. Never before has an ethnic group made up so large a share of the youngest Americans. This speaks to this urgency of this book which will support young Latinos in keeping their cultural ties, operating in a way that reflects their values, and charting the future of our community. . Sustained by a culture of celebration, faith, and hope, Latino power is destino (destiny). It the collective contribution Latinos will make. Based on their people-centered values, inclusiveness and bienvenido (welcoming) spirit, Latino leaders are building a diverse and people-centered society. Integrating a model on Latino leadership is a work in progress. Just as Latinos are immensely diverse, so are their leadership forms. This book’s purpose is to start a conversation on how Latinos lead. I humbly understand people may not always agree with the concepts. I acknowledge the wisdom and experience of the many leaders in the Latino community and welcome their perspectives and insights. So what are my credentials for writing this book? I am Pan-Hispanic. Perhaps more simply said my destino, which is a person’s unique life path, opened doors for me to experience the many facets of my Latina familia. This allows me to put forth a leadership model that brings together the nuances of the culture, yet at the same time is comprehensive and reflective of our rich diversity. Florida where I was raised is a cauldron of Latino culture. My extended family includes Mexicans, Columbians, and Cubans. My great grandmothers were from Peru and British Honduras. I trained for the Peace Corps in beautiful Puerto Rico and served in Chile. Finally I have lived in Colorado 40 years among my cherished Mexican-American hermanos which has instilled a deep love for these politically-oriented and Mariachi-lovingpeople. My first book, Salsa, Soul, and Spirit: Leadership for a Multicultural Age contained 9 leadership principles from Latino, Black, and American Indians in the U.S. This multicultural model encouraged enriched American leadership by including the enormous contributions of communities of color. My goal was to inspire a core of multicultural leaders who recognize that diversity and inclusiveness are indispensable to crafting an equitable democracy and a global community. I also wanted to honor the points of convergence from the common history and experiences shared by communities of color who despite racism and discrimination continue to focus on mutual advancement, people-centered leadership, and responsible social action. Communities of color must identify the common ground and work together to bring their immense potential to fruition. As a Latina, however, I want to further this work by highlighting the values and experiences that flow from my own culture and integrate these into a unique leadership model. The Power of Latino Leadership offers additional dimensions to the multicultural leadership principles in my first book. I recognize the vast contributions that the many cultures in our country have made and their unique forms of leadership. It is beyond the capacity and length of this book to integrate their rich perspectives. I hope by reading this book, they will develop a deeper appreciation of the connecting points in our myriad cultures and further the conversation about multicultural leadership forms. Many mainstream leadership books are written by scholars, have a theoretical framework, and may be based on research. When applicable I reference and connect their work with current Latino leadership practices. While I have learned from and appreciate their vast contributions a book about Latino leadership, if it is to accurately reflect its topic, requires a person who has practiced leadership in a proven and productive way. My “mainstream credentials” include teaching at the Center for Creative Leadership, the most highly utilized corporate center in the world. I served as an adviser to the Kellogg National Leaders Program; vice-chair of the Greenleaf Center on Servant Leadership board, and a trustee of the International Leadership Association. I have worked with the Hispanic community since I was 21 in the barrios of Santiago, Chile. 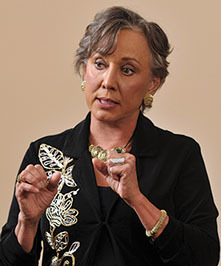 I later served as executive director of Mi Casa Resource Center, the first president of the National Hispana Leadership Institute, and am the founder of the Circle of Latina Leadership in Colorado. In partnership with many organizations and talented Latinos, I have designed and implemented Latino leadership programs in Arizona, Colorado, Ohio, Illinois, Washington D.C., New Mexico, Florida, and Texas. My article, Latino Leadership: Building a Humanistic and Diverse Society was published by The Journal of Leadership Studies in 2001 is one of the first conceptual frameworks on Latino leadership. And speaking of destino, what luck that you are reading this book. Ah, perhaps it is not luck; perhaps it is your destino that your past and present have led you to this point of learning about the powerful leadership forms in the Latino community. Latinos can take pride in the immense contributions our leaders have made. Young Latinos can learn that keeping their culture will make them more powerful and successful. Non-Latinos can become more culturally adaptive and start using the principles in this book to lead with a more inclusive spirit. We can all infuse our leadership journeys with a renewed sense of purpose and a vibrant Latino flavor! Ok I admit it – I love mi cultura (my culture) and as you read on you will see that I am a Latina convert! I assimilated back in the late 1950’s. But I knew had lost a brilliant aspect of my cultural soul, and by serving in the Peace Corps in Chile, I reintegrated the beauty and power of my culture. So I am a Latina by birth and a convert by choice! In this book, I present Latino culture from our very highest standards. Hopefully, by expressing our cultural zenith, leaders will emulate these values and young Latinos will embrace the traditions of their abuelos. This is not to deny the inconsistencies and less than desired aspects present in all cultures. For Latinos, however, discrimination and colonization are historical traumas. Remnants of these difficult circumstances endure in higher rates of poverty, lower educational levels, and diffuse identity. I would like the reader to consider that mainstream leadership books routinely emphasize the “ideal.” Books such as Good to Great or In Search of Excellence: Lessons from America’s Best-Run Companies put forth the possibilities when visionary leaders take the helm. Authors do not spend much time on topics such as “In Search of Mediocrity” or “From Bad to Worse,” although there are plenty of middle of the road leaders and organizations. By stressing the ideal – the best of the best – and by having positive models to emulate, leaders and organizations expect to improve and move closer to that ideal. Likewise when Anglo values and cultural norms are discussed, the positive attributes are usually highlighted. Accordingly, this book presents Latino culture, values, and leadership in the very best light. I hope this enhances our pride and encourages young Latinos to stay connected to their culture and bring their unique gifts and assets to America. And may reading about the Latino ideal, nurture understanding and respect with other people who read this book and wish to share in our wonderful culture and powerful forms of leadership.